The e-commerce leader just unveiled digital versions of its Dash buttons — those tiny, physical gadgets that allow for one-click reordering of your favorite products with one tap of a finger. The new virtual Dash buttons started appearing on the Amazon.com homepage and the Amazon app home screen on Thursday night. The company is automatically creating ones for items you recently ordered or order often. An order is placed with one click or tap on the digital button. An Amazon spokesperson said Prime members can create a virtual one-click button for tens of millions of products available for Prime delivery. “Add to your Dash buttons” is now an option on the product page of all eligible products. This makes sense. Amazon keeps on getting better at making reordering as easy as possible. 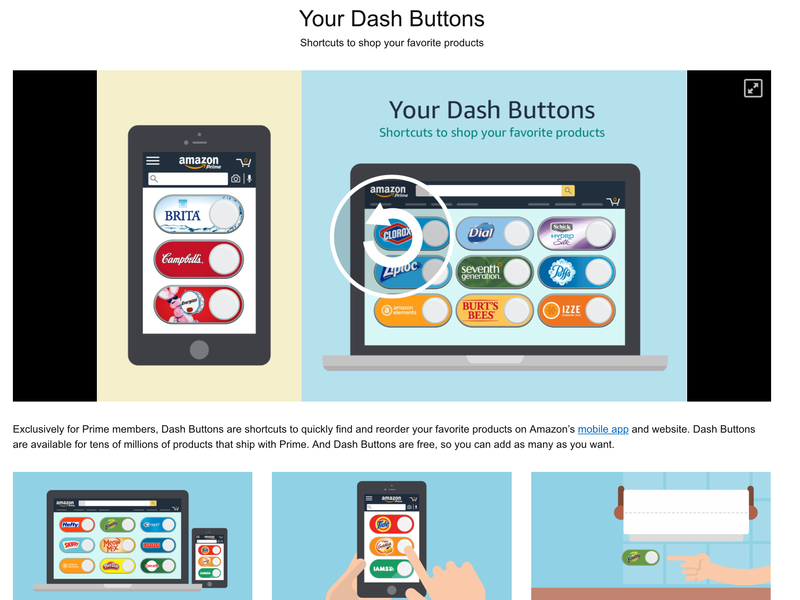 Find Dash Buttons on the Amazon home page, or at Your Dash Buttons, where you can sort, label, or delete your buttons. If you’ve purchased a product on Amazon that is typically reordered, we will automatically create a Dash Button for you. You can add new Dash Buttons from the product details page of any product available with Prime shipping. Combine those virtual Dash Buttons with the rumor that Amazon is building a version of the Echo with a screen. Combining the online functionality visually with the physical buttons is a clever way to increase the mindshare for the whole Dash Button system. Virtual Dash Buttons make especially a lot of sense within a mobile app. Preferrably, this should get its own dedicacted mobile app. This way, Amazon could integrate the Dash re-ordering into the mobile operating systems’ features; like widgets or iOS’ 3D touch on the home screen for example.